The introduction of Swiss manufacturers in India has given cyclists a wider range to choose from. After the Scott Speedster 20 Review, we have come to believe that the lighter frame is ideal for any amateur or newbie to start his journey. The quality on offer makes it a good pick without burning a hole in your pocket. Not to forget, it’s Swiss make is sure to get heads turning as you zoom past on it. During the progress of the Scott Speedster 20 Review, we learnt that the carbon alloy composite fork and alloy frame can risk hitting potholes. 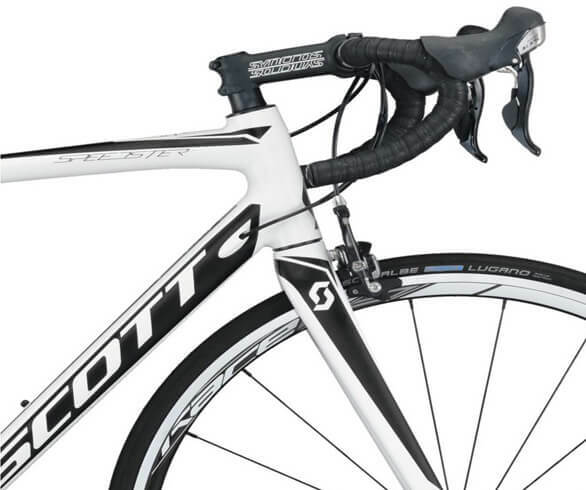 Not many may know that the Scott speedster series is fabricated on the same principle as its daddy- The SCOTT Foil. One of the high-end bike frames cloned into the Scott Speedster 20 Review shows that the bike is naturally aggressive with efficient airflow. The speedster 20 comes with cutting-edge Shimano 105 with integrated cables which add to its looks and keeps the airflow clean. The 8.9 kg bicycle allows one to push easily on climbs with a 34/50 crank. The semi-aero Syncros wheels are sturdy and can take the pounding of the Indian boulevards. The Syncros saddle being softer has an inherent quality to lessen the spanking and makes racing endurance smack free up to a degree. The textured seat on the sides holds on to your gluteus as you shift ratios and keeps you steady. The Scott Speedster 20 Review was fascinating due to the bike has amazing handling both downhill as well as flats, irrespective of the speed you choose to ride at. Once the Scott catches momentum, it simply keeps rolling and on your way downhill, it almost whizzes past. The bike is similar to a rocket when it comes to descends, with the breeze kissing your face. Where the other bikes are put to tests and have failed, the speedster has emerged to prove its value. The bike is available in all sizes and can be purchased at Bikeshark and Keny cycles. The Scott Speedster 20 Review revealed that the bike combination of great handling, speed, easy to push and great aerodynamics. The bike has great potential to be upgraded. If you want a starter bike that you can upgrade to a great bike, then this one is the one to go for. The price value for the component structure you pay, cannot beat any bike presently in the market. Like quite a few road bikes on the market, the speedsters drawback is a firm ride which can rattle a bit on rough terrains. If you are serious about cycling, then you might want to change the wheels as the spoke tensions along with the hubs can be replaced for something better. Also, the 110mm stem is extra long for most of the cyclists and that too might need a replacement. Some have also complained about the seat post getting a bit uncomfortable, especially during longer rides.